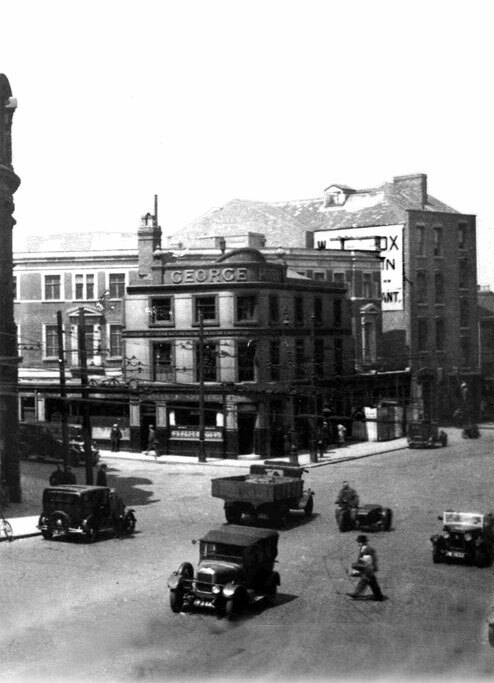 The George Hotel, Stafford Street, Wolverhampton (via LostWolverhampton). In this picture, the pub is still the renamed Black Horse, the Victorian (or earlier) coaching inn, and the tall building behind is a similarly old one. This post follows some preceding ones on the continuing history of the area once known as Carribee Island in Wolverhampton. This area, designated a slum, was pulled down in the 1880s but as these posts have seen, the community life in and around the area remained shaped by its past. Until the 1921 census returns are digitised and released, some of the social detail of the 1920s and 1930s can be hard to get to. It’s a frustration, because this tumultuous period was an exciting, if fraught, one in Wolverhampton. The interwar years were decades of industrial strife and general strikes, global financial crises (sound familiar?) and unsettled politics. Wolverhampton’s industry was pulsating, though, to the sound of the internal combustion engine: firms like Guy, Star, Villiers, AJS and Sunbeam were producing nationally-important cars, and even internationally-important ones: the Sunbeam 1000HP (or “Slug”) broke the land speed record in 1926. Sunbeam also made bicycles, as did Wearwell and Viking; Chubb was retaining the town’s stake in the lock trade; Mander’s were one of the biggest paint and chemical companies; Courtauld’s made Rayon, Goodyear made tyres, Chillington made tools, and many more firms poured forth an array of manufactured goods. Wolverhampton was even home to the world’s first automated traffic lights, right at the junction of Stafford Street and Broad Street. We’re very lucky, then, to have a fantastic set of memories recorded by Bev Parker belonging to George Peck, who was born on Herbert Street in 1910. Despite this boom (and George later worked for the booming Sunbeam) growing up between the wars seems closer in practice to the Victorian poverty that I research, and less like the modernity we might expect from such work. Other historians have concurred – George Barnsby’s book on housing highlights the continuing lack of progress in sanitary and housing reform in Wolverhampton. George Peck’s Herbert Street was partly demolished during this period in the town’s second wave of slum clearance. The job was completed in the 1950s and 1960s, and though Herbert Street still exists in name, there’s no residential space there now. It’s difficult to get an overview of social life during this time, but we can get a glimpse using the 1939 Register. This is by no means an unproblematic document. It only includes England and Wales for a start, and doesn’t record lots of info that I would like, like place of birth, relationships, and so on. But we can certainly look at some of the institutions that survived the Improvements of the 1880s, namely the pubs which, George assures us, were still prevalent in the 1920s and 1930s. In fact, Stafford Street itself was a classic pub crawl. NB – the 1939 Register is available to view via FindMyPast, which can be expensive – but it’s often free to access at your local library or borough archives service, and they can also help navigate the problems and benefits of various similar family history databases with you. For this, you started in the Criterion, now the P3 coffee shop. From there, head to the George Hotel at the corner of Stafford Street and Horse Fair. Formerly the Black Horse, run for many years by William Marshall, this Banks’s pub rebuilt with a large round entrance, and was run by Colin and Sarah Leeke. It’s now a part of the University of Wolverhampton estate. Proceeding up Stafford Street (in policeman speak) in a suitably zigzag fashion, the next stop was the Vine. This is now the University lecturers’ watering-hole of choice renamed the Hogshead. It’s an old, old pub – or rather, license, as the original was knocked down by the Improvement Scheme. That pub was the site of the St George’s Day party I’ve talked about before, in 1873. Harold Parkinson was landlord in 1939. Next was the Hibernia, run in 1939 by Thomas Rea, an aircraft machinist who ran the pub in his spare time. This was quite common throughout the preceding century and likely meant that the burden of the pub labour fell on his wife Alice, listed as “unpaid domestic duties” here – an extremely common nomenclature in this survey, essentially a euphemism for housewife. A famous Black Country example of just such an arrangement was the Cross Guns in Cradley Heath. Ostensibly run by the infamous Joe Mallen (of Staffie-breeding fame), he actually worked long hours making chains at William Griffin & Sons, and his wife did most of the pub work. The Hibernia gained its name during the mid-nineteenth century when this part of town was teeming with Irish immigrants. The Four Ashes lay at the corner of Stafford Street and Charles Street, managed by Joseph Pearce, and the Britannia on the same side. On the opposite side, at the junction of Cannock Road were two pubs: Ansell’s Junction Inn – run by Lily M Goodman – and the famous Elephant & Castle (on which more next time). At the bottom of Broad Street was the Squirrel Inn. This was in “The Hole” – the road had been raised to benefit railway traffic in the early 1850s but the old houses left with a low walkway. Westbury Street was perhaps the most evidently Irish link (Hibernia Inn notwithstanding). The Daniel O’Connell had been there on the corner of Montrose Street since the road was built in the 1830s, formerly known as the Traveller’s Rest. It was still going in 1939, run by Henry and Ethel Sambrook, with their daughter Edith living at home as a barmaid. The pub was named after the Irish politician, of course – O’Connell was nicknamed “The Liberator” for his work in trying to get the 1800 Act of Union between Britain and Ireland repealed. He wasn’t successful in his lifetime, although his amazing powers of oratory did help bring in the Catholic Emancipation Act of 1829, which finally gave Catholics of all nationalities across Britain a say in public affairs. Almost opposite on Westbury Street was the Limerick, another old pub with a strong Irish tradition (obviously, you would think). John Kingdon ran it in 1939; in the 1870s it had been James Cahill, a redoubtable organiser of Wolverhampton’s Irish community. At the end of the road (past St Patrick’s Roman Catholic church) was the Warwick Arms, run by Joseph Price. In 1853, the chief of Wolverhampton Police Col. Gilbert Hogg had informed the Select Committee on public houses that there were 35 pubs in just this small area alone. This would have included large coaching inns such as the Black Horse, but also an array of beershops – licensed to sell beer only, no spirits – which could essentially be someone’s front room. Licensing crackdowns from the 1870s put paid to many of these, and the crusading Temperance movement attempted to ensure that fewer licenses were gained in ‘problem’ areas like this, where drunkenness had been such a fear in the 19th century. This fear was absolutely wrapped up with fear of the presence of the Irish, who were stereotyped as dangerous drunkards. There were many fewer Irish-born residents of these streets in the years that followed, but that isn’t to say the space didn’t retain something of the cultural legacy of its Irishness. Pubs – and the church – were a reminder of the past and a meeting point in the present. The coming war would see immigration from Ireland begin to rise once again, and next time we’ll look at the area in the post-war era. This is a fabulous read. Will have to bookmark this!